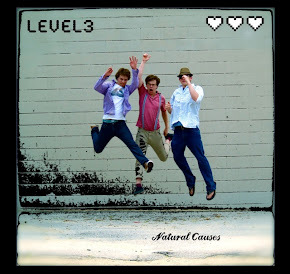 Level3 is an Alternative Rock trio from Austin, TX featured in the young adult novel, REUNITED. Has One Direction been hacking our email again? Or are vintage V.W. vans & boy bands just a really cool combo? You be the judge. 1D's music video for "What Makes You Beautiful." Versus: Our song, "Heyday" in the book trailer for "REUNITED." Level3 was recently featured in the Young Adult book, REUNITED. (Luke Dixon, Ryan Hale, and Travis Wyland, all 21) are three childhood friends who grew up together in Austin, Texas. Level3 first started playing music together when the boys were only in the eighth grade under the name, Hat Trick. Just over a year later, they had changed their name to Level3, signed to a small indie label, and released their (self-title) first album, which immediately began making a splash on the college charts. The next year, Level3 put out their second album (Rough & Tumble) to rave reviews and received their first airplay on MTV. The following year, the band had signed a three-record deal with Sony Music, and produced their first CD under a major label, turning the boys into instant, though reluctant, teen heartthrobs. By the time the boys were 18, they had taken home two MTV awards, had three singles rise to number one on the Billboard charts, and won a Grammy. But sudden fame had its price. Midway through recording their fourth album, to the dismay of their fans, Level3 called it quits, putting an end to their short career at the peak of their success. Level3 recently made headlines by getting back together for a one-night-only reunion show in their hometown of Austin, TX.